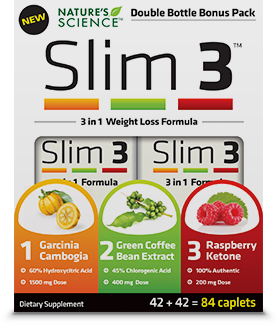 Nature's Science Slim 3™ provides three of the hottest premium ingredients in one convenient weight loss formula. Unlike other products, Nature’s Science Slim 3 is made with premium garciniacambogia, green coffee bean and raspberry ketone! Nature's Science Slim 3 delivers 1500 mg per day of premium Garcinia Cambogia extract that is standardized to 60% Hydroxycitric Acid. Nature's Science Slim 3 contains 200 mg of premium Raspberry Ketone. Raspberry Ketone is naturally found in raspberries and is responsible for their sweet, fruity smell.